Sutton Council are proposing to use funding from Boris Johnson to put a new gravel path through Cuddington Rec and are asking people what they think of the idea. 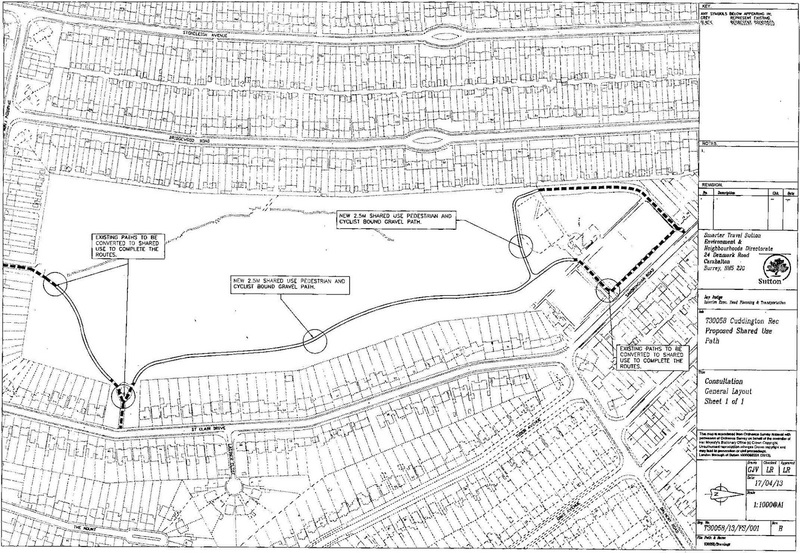 The proposed path, which has been asked for by a number of local park users, has been agreed in principal by the Cheam North and Worcester Park Local Committee (CNWP). For background information the CNWP is a council committee that deals with the three Council wards: Nonsuch, Stonecot and Worcester Park. 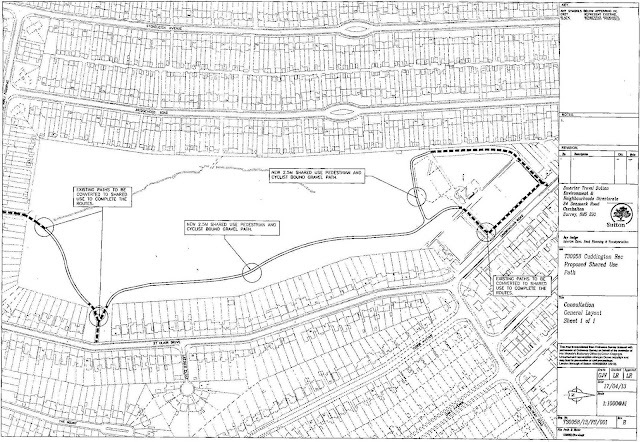 The path which will link the park access points in Sandringham Road, St Clair Drive and Sparrow Farm Road (see map), is one of several being proposed in the area to help expand the borough cycle route network, improve walking routes and help promote sustainable travel within the Borough. The blog understands that £100,000 has been allocated for the work, of which £5,000 was won at last year’s Participatory Budget Event and Boris Johnson, even keen on cycling, has enthusiasticly contributed the remaining £95,000. Some local residents however are not pleased with the idea. One lady contacted the blog to say she was utterly horrified to hear that they wanted to put a dirty great concrete path all the way though the park. She has discussed this with many of my neighbours and those she meets in the park regularly and they were all equally horrified at the thought. She is worried that as many are elderly, they will be unlikely to start emailing the council to tell them how they feel. "I live right next to the park and spend a great deal of time in there every day. It's one of my favourite places to go as, not only can I walk my dog, but the conveniently placed tree line means that for a few moments a day, you can't see the houses on either side and can pretend that the rest of the busy urban world just doesn't exist. It's my little sanctuary of sorts!" "I honestly see no need for this horrible path whatsoever and feel that the council are just using this money from the Mayor to make unnecessary changes rather than improvements that we have all been wanting for years. In the letter they state that the path is intended for use by walkers and cyclists all year round. Admittedly the park gets a little muddy in the winter- but such is nature! And my fellow walkers and I are all happy to don a pair of wellies when it gets muddy! As for the cyclists, I don't think I have seen a single one in the park in the last 5 years. (And I do spend a great deal of time there)"
Do you live near Cuddington Rec? How do feel about £100,000 being spent on this path? The Council consultation ends on the 10th of June so if you have a strong opinion one way or the other, now is the time to voice it.